Alright folks, I need your help, and quick. Sorry for the last minute notice, but I just got this thing together. I'm hoping to raise some money for conservation and raise attention for a really important refuge for birds in midst of rampant urbanization (and suburbanization); Rockefeller State Park Preserve in New York. 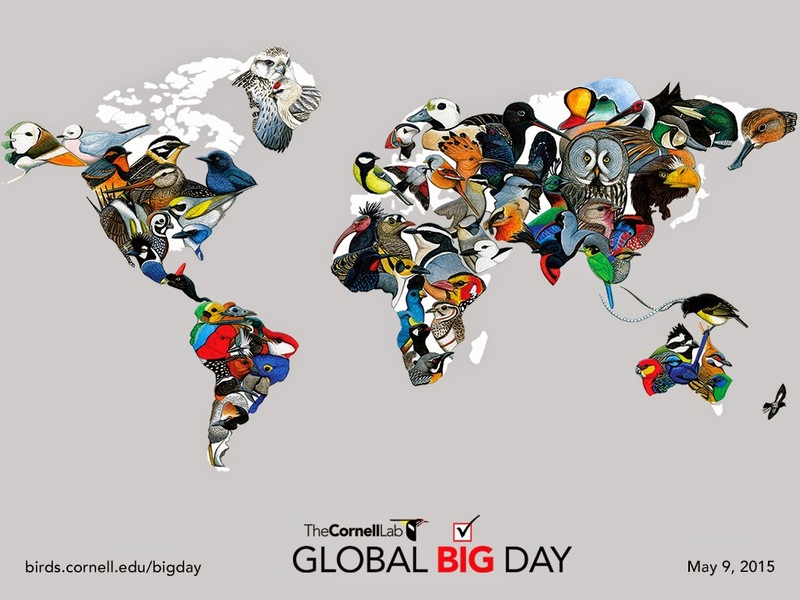 This Saturday, May 9th, I'll be participating in The Cornell Laboratory of Ornithology's Global Big Day. Cornell's birding teams are conducting their annual spring Big Day attempts, and in a twist this year, they are asking birders globally to participate and submit their observations through eBird.org. They are hoping to collectively record over 4000 of the world's bird species, and more importantly provide an intense one-day snapshot of the world's bird populations. What is a Big Day, you might ask? A big day is when a birder or group of birders attempts to see as many species as they can within a 24 hour period. This can be done for fun, for competition, for science, or to help raise funds and awareness for bird conservation; and more often than not a combination of all of those reasons. I've never been a huge competitive birder, but I am definitely excited about the fun, science, and bird conservation parts! I'm adding my own twist by restricting my own Big Day effort to the Rockefeller State Park Preserve complex in Pleasantville and Sleepy Hollow, NY. I'm currently volunteering on a big breeding bird project with the Preserve and I thought it would be fun to see how many species could be seen in the complex within a 24-hour period. In addition, I hope my data will help provide a snapshot of what the bird populations in the Preserve look like during peak migration. Mainly, I want to draw attention to the fact of what an important area for breeding and migratory birds the Preserve is, in a relative sea of development north of the New York City area. So, I'm hoping you'd be willing to support my effort with a monetary pledge to Cornell for bird conservation (and/or record your own bird data on Saturday and enter it into eBird). You can pledge any amount you'd like. You can pledge a straight sum, or pledge a certain amount per bird species seen. I'm setting the ambitious goal of seeing 100 species of birds (for a relatively small inland refuge with a relatively narrow range of habitat types, this will be a tough goal to meet). Any amount you can give is wonderful. Please indicate your pledge or commitment to donate in the comments below and then donate at birds.cornell.edu/bigday right now or at the completion of my Big Day effort. When donating, please include the hashtag #RockefellerBigDay in the comments section, so the donation can be attributed to the Rockefeller effort. 1. I will count birds at different locations within the Rockefeller State Park Preserve complex on Saturday, May 9th, from approximately 3am until the end of evening twilight (around 8:30pm). I will not be going from midnight to midnight as there are very few night birds I can hope to pick up and it will be a little easier on my body. 2. All birds must be seen or heard on or from the Rockefeller State Park Preserve complex (including Stone Barns and the carriage paths on Rockefeller Family land). As I hope my data will have some conservation/scientific use, I will only record species that I'm a 100% sure of the ID, regardless of whether they are heard or seen, or both. 3. Whenever I have phone signal, I will try to live tweet my efforts at the hashtag #RockefellerBigDay and the account @WhimbrelPhoto. Please feel free to follow along and tweet some encouragement! 4. Tomorrow (Friday, May 8th), I will do a blog post outlining my plans for Saturday and how I hope to piece together 100 species from different parts of the Preserve. I'm pretty confident that 83 species are pretty solid, but the last 17 will take some luck and I definitely can't afford any missed species. 5. After the effort (but maybe not until Sunday), I'll write a blog post here summarizing the day. If you use eBird, you will also be able to view my bird lists by clicking on the various Rockefeller State Park Preserve hotspots (hopefully entered Saturday evening before I collapse). Thanks very much for your support! Please share this blog post far and wide, so it gets seen before Saturday!